Nar Phu Valley Trek is a recently opened, exciting trek in a very low in tourist traffic, the north region of Manang. Closed to tourism until 2002, Nar Phu Valley region remained untouched and uninfluenced by the modern world, contrasting with the popular, neighboring Annapurna Circuit. The trail begins in Syange and follows the Popular Annapurna Circuit. It branches off at Koto, where you will take the off the beaten track to Nar Phu Valley. In this region, the vegetation gradually changes from alpine to sub-alpine scrub. It is a natural habitat of blue sheep and snow leopard. Nar Phu Valley Trek combines high peaks and passes, glaciers, remote villages, narrow canyons, beautiful forests, fantastic rock formations, yaks, Gompas and warm, welcoming culture. Valley has around 300 native inhabitants depending mainly on yak herding and salt trade. Beautiful medieval Phu village is the best place to understand the real lifestyle of the local Bhote communities. Nepal government’s recent decision to open up Nar and Phu to tourists has evoked a little enthusiasm among the villagers, whose rural lifestyle continues. Annapurna Conservation Area Project (ACAP) recently extended its network to include Nar and Phu Valley and is preparing a suitable tourism development plan for this undiscovered region. Along with spending plenty of time in those colorful, traditional villages, we will also explore the high alpine valleys above Phu, including Himlung Base Camp and crossing Kang La Pass, from Nar to Ngwal on the Pisang route, leading back into the Annapurna Circuit. The next part of trekking leads through the dry, desert-like Tibetan Plateau, allowing access to Muktinath and Jomsom trails. Muktinath has become the center for pilgrimage for thousands of Indian and Nepalese Hindu followers. The picturesque Manang and Mustang Valley, magnificent Kali Gandaki and Marsyangdi Rivers, close up views of the Himalayas, varied ecosystems, green paddy fields and oak forests, arid deserts and the deepest gorge in the world, make this trek one of the most stunning in the world. Heading to the headquarter Jomsom, we move to the north to Kagbeni along the riverside way of Kali Gandaki. This trek is an excellent adventure and add-on to a visit to the Manang region or the Manaslu trek. Nar Phu Valley Trek offers you an unforgettable experience of the purest Himalayan environment, landscape, and culture. Don’t wait, contact us directly for bookings and we will help you to explore this amazing part of Nepal. Best Travel Time: February to Maye, September – November are the best seasons. Dec & January are Winter and cold can be snow on the trail, June, July & August are rainy time, trekking can be done but visibility can be poor due to rain..
We will meet you at Kathmandu Tribhuvan International Airport and transfer to your hotel. When you have had your time to settle in and freshen up after your long fight, you will be invited to visit our office for a briefing about your program. You will have the meeting with your trekking guide and discuss the equipment needed for the trekking, and we will process for the trekking permits. During this visit, we will help you check your stuff and facilitate the processing of other necessary items such as National Park Permits, special permits, etc. If you arrive at night, we will have the same discussion in next day morning after your breakfast. From Koto we will start our Narphu valley trekking working through a steep and narrow path through the dense forest. Much of today’s walk is spend in the shade of deep gorge Nar Phu Khola. The trail climbs steeply above the river through a silent forest of cliffs, pine and bamboo, passing several scales hand-swan timber camps and caves. After crossing the Phu Khola, detour downstream to a small but charming riverside hot spring. The trail ducks dramatically under a waterfall arriving at Dharmashala. Overnight camping at Dharmashala. From here climb past a landslip and a goth to cross the side stream. The trail climbs up the valley along the small river before arriving Meta (3700m), a nonpermanent winter settlement of Nar. The next section of the trail is far more tortuous as much of the energy is spent crossing a roller-coaster maze of glacial moraines. The landscape is combined with white rocks, low shrubs, juniper, scattered evergreens, delicate brick-red and orange leafy bushes, crumbling shelves of flat slate and white, sandy trails. 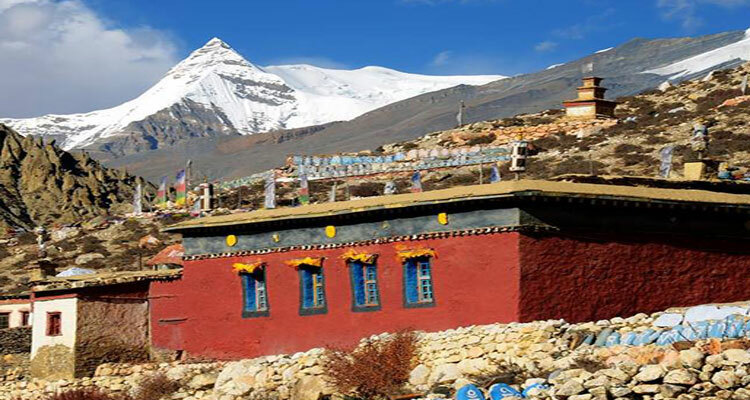 A short walk brings you to a trail junction having a clear view of Nar valley with monastery and chorten. After passing the Jhunam (3640m) we arrived at Chyakhu (3800), formally a Khampa settlement. Passing many chortens, uphill and downhill finally, we arrive at settlement valley Kayang. Superb mountain views of Pisang peak, Annapurna II, gyaji Kang etc can be seen here. From Kayang you quickly swing into the dry, desert-like gorge of the Phu Khola, inching along on a hair-raising section of trail carved out of the cliff face. We will work steeply down the hill along the river bank and past the submarine rock with a small campsite. Best view of unique, colorful chortens with the canyon lands and gorges. Keep your eyes out for blue sheep grazing on the khaki Hill. The trail edges along the eroded hillside past Phupi Gyalgen Gate to descend to the collection of chorten beside the bridge. This ancient gate provides you the first view of the three villages of Phu, as well as an old “dzong” and the remains of the two forts, which are all now in ruins. Spend your night in camp. You can have interaction with locals and explore up the wide valley systems above you. Again walking up and then coming back down is better than just resting in high altitude. You might walk up the valley to the summer grazing settlement or Kharka at Ngoru to acclimatize and physical fitness to Kang La pass. Phu itself is an incredibly interesting village and you can observe the villagers spinning their yak and sheep wool and chat. Phu village is snow bounded almost completely deserted in winter. Stay in camp overnight. Today we will trek back to Phu gate Khyang, Chyarkha and Jhunam to the junction where the trail branches right to Nar. The trail drops past fantastically eroded hoodoos, over sandy gullies connected by bridge-like platforms. Look for the ruined Zampa Cho Dzong (a dzong is a fort: zampa is Tibetan for the bridge). Along the way, we’ll get to see some beautiful gorges and some breathtaking scenery also. You finally reach the Nar gates at the top of the hill and pass by yet another line of wonderfully painted; bamboo topped chortens and a sizeable tiered chorten. Stay overnight at camp at Nar. Today’s climb starts immediately with a steep burst up to the main trail and it doesn’t ease up for an hour or more. Kang Garu peak reveals itself across the valley. The trail goes through the grazing field with a small stream on the left. The trail leads through the village with the superb view of Pisang Peak to yak the grazing Alps. Traverse Yak pastures and descend to the head of the valley. Overnight stay at the campsite of Kang La Phedi. The Kang La is not a steep pass, but it could be a long day if there is snow on the pass or the altitude is taking its toll. We start early morning today for the Spectacular Kang la pass which provides the magnificent view of Pisang peak, Annapurna II, Gangapurna, Tilicho peak, and the airport at Hongde. Descend overlooking the picturesque landscape and cinerary which past Yak and sheep shelter finally brings you Ngwal after the long day walk. Ngwal is a beautiful, old village of cobbled streets, prayer wheels and beautiful architecture, obviously a hub of religious activity in previous times. Stay overnight at camp in Ngawal. It’s an easy day to Manang with the superb view of Annapurna II, Gangapurna, Annapurna III, Gandharva chuli and Pisang Peak on the background. We will work thought flat valley along the bank of Marsyangdi River. On the way, we will pass pine forest, farming terrace and beautiful village of Braga. En route we can visit Braga monasteries. You can enjoy the views of the Annapurna range, Tilicho Mountain, and beautiful landscapes. Manang is a small town. Stay overnight at camp in Manang. The trail continues to climb out of the Marsyangdi Valley. The trail follows this valley north, passing a Goths as it steadily gains elevation. You have left the large trees below; the vegetation now consists of scrub juniper and alpine grasses with moving the Marsyangdi the trail ascends up to Tenki. From here continue to ascend to Letdar via Yak kharka. It’s fun to see large yaks grazing. The view of Annapurna III is excellent. From Letdar the trail climbs along the east bank of the Jarsang Khola, then descends and crosses the stream on a wooden bridge at 4310m. Blue sheep, and even snow-capped leopards, sometimes magically appear. The crow-like bird choughs, large lamer geiers, and Himalayan griffons circles you overhead. Overnight at Phedi or can continue up to the High camp. From Muktinath to Jomsom, we see people from Mustang who comes to sell handicrafts to pilgrims. Among them, merchandise is the highly revered mollusk fossil called Shaligram. The trail gradually goes down to Jharkot with the picturesque kani (large Gompa). We will pass some ancient caves and view the impressive white snow-capped mountains. The trail stroll among meadows, streams, poplar and fruit trees, finally we arrive Kagbeni a gateway to Upper Mustang; it has to pose Chortens and ochre-colored Gompa and monastery. After lunch in Kagbeni continues trekking to Jomsom on the windy trail of Kali Gandaki valley, overnight at Jomsom. Early morning we will take a short picturesque flight to Pokhara. The view of Annapurna and Dhaulagiri mountains and world’s deepest gorge, Kali Gandaki is stunning. Relax whole day in Hotel or wander around Lake Side with fascinating mountains panorama view and nature charming. Explore the various exciting places like Mahendra Cave, David’s fall and the numerous lakes of course. Take a flight or drive by tourist bus/Private car to Kathmandu. In the evening you can have your last night in Nepal enjoying the Nepali cultural dinner show, taking some beautiful snaps and making up your mind about the returning journey. You can have a greeting exchanging among friends and with all Nepalese people.